Before I had Rocco I had no intention of co-sleeping or bedsharing. In fact, I hadn't even given it a second thought. Babies slept in Moses baskets or cots and that was just how it was. I also never expected to have post natal anxiety. I didn't plan on spending nights awake with my hand on my babies chest making sure he was breathing, but this is how our bedsharing began. 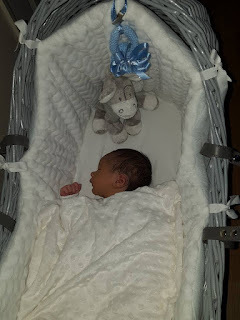 Rocco had a beautiful Moses basket, it was grey wicker and I was totally in love with it, problem was that when he was asleep in it next to my bed on a night time, I couldn't see him. I know it sounds totally ridiculous but I was so anxious that something was going to happen to him that I needed to be able to have my eyes on him at all times. So after a few weeks we moved him into a little swinging crib. This was better as I could see him through the bars but I was still anxious as hell. As we were breastfeeding on demand, and he demanded a lot, sometimes at about 5am after a feed I would keep him in bed with me. 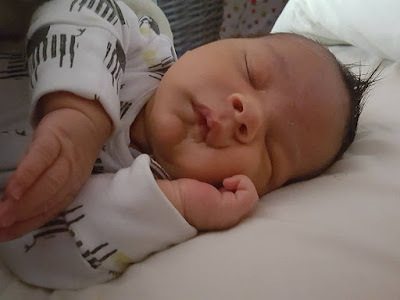 I had done an extensive search about safe co-sleeping guidelines and decided to make our sleeping space safe so that if I did bring him I knew that there was nothing that could harm him. This included getting rid of all pillows from around him and never having the duvet near him, I would make sure to wear long sleeved pyjamas so that the duvet wouldn't have to be any higher than my hip, also learning to sleep in the 'cuddle curl' position. In those days Gary slept on the sofa most nights. By choice, bless him, I was getting so little sleep due to breastfeeding (I chose not to express,) that I would snap at him for everything. So I made Rocco a space in bed and every night it seemed to get a little earlier that I would let him stay in bed with me. When Rocco was around 5 months old the lease ended on our current house and we had to go and stay with my mam until our new house had finished being built and was ready to move into. Gary was welcome to stay and did so some nights but since it was such a small space he spent a lot of nights at his Mam and Dad's. This is when I got into the habit of just letting Rocco sleep in my bed from the off. I didn't really tell anyone as I knew it was such a controversial topic but I loved having him next to me. I slept easier knowing he was by my side and I think he slept better being close to his mama. 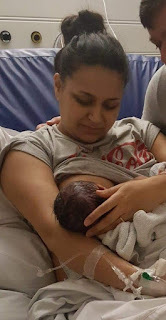 It also made breastfeeding a whole lot easier as I had such a bad back after pregnancy that getting up to put him in and out of his crib every hour was taking it's toll. Once we moved into our new house Gary soon came around to my way of thinking and accepted that bed-sharing worked better for everyone. So instead of putting up Rocco's cot and moving him into his own room, as a lot of my friends with babies the same age were doing, we bought a super king size bed for the three of us. And now... at 2 years and 7 months old, I'm not ashamed to admit that Rocco still sleeps with us, and probably will do for a little longer. He is happy here, I know he is safe and comfortable and as for making him clingy, he's probably the least clingy kid I know! Actually studies suggest that co-sleeping helps create a secure attachment which translates into the child feeling secure and knowing that their caregiver will always return to meet their needs, in turn promoting independence. The mama baby closeness when bedsharing helps to release the 'love hormone' oxytocin which plays a huge part in bonding with your baby. While it is, of course, completely possible to have just as much as a bond with your baby without bedsharing, it offers an extra opportunity of closeness and the best baby shnuggles. I love having cuddles every night from my little boy and how long is he gonna wanna cuddle up with his Mama and Dada for? Probably not too long! So we're stealing all the snuggs whilst we still can! If you are interested in safe bedsharing and information on reducing the risk of SIDS click here.